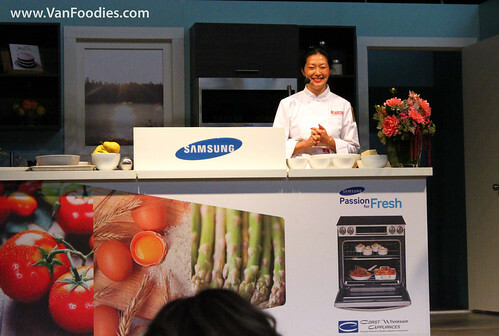 To kick off the 30th Vancouver Home + Design Show, I was invited to a pop up dinner party on the show floor on opening night. 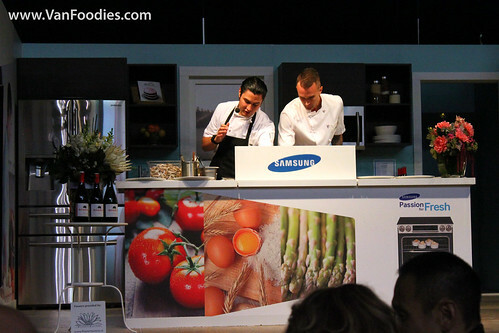 Taking turn on the Vancouver Magazine Cooking Stage were local chefs who put together a great three-course dinner for the 20 or so of us. To start the dinner we received a glass of cocktail that was inspired by the new Samsung fridge that dispenses sparkling water. 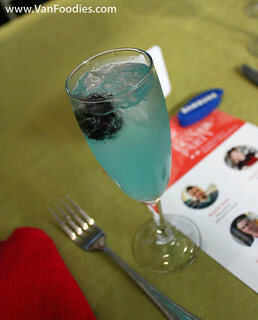 It had Alize, vodka and sparkling water. 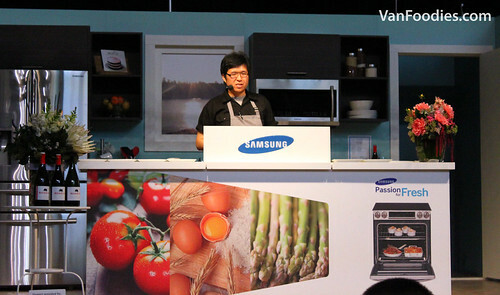 By the way, at the event we also learned that Samsung has released a cooking range with an oven that can be split into two smaller ovens (with two different temperature settings) with a smart divider. It would probably cost you a fortune but I thought it was neat. 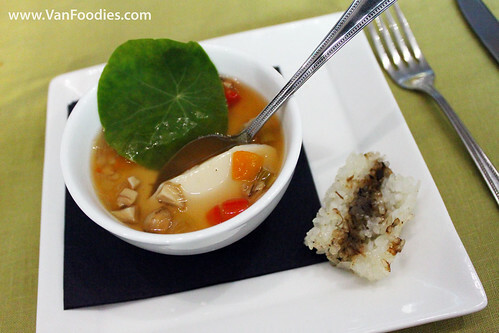 A Taste of the East by Chef Curtis Luk of The Parker – chawanmushi, celeriac, pine mushroom broth, yaki onigiri. It’s great for the cold fall/winter weather. 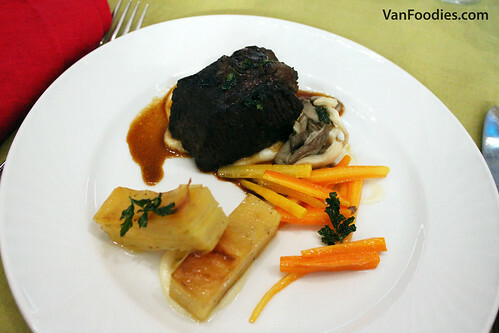 Slow Cooked & Sumptuous by Chef Jeff MacIntosh of Boneta – slow braised beef short rib, cauliflower celeriac puree, lemon potato pave, oyster mushrooms, heirloom carrots, fried parsley. While the beef short rib was good, the highlight for me was probably the potato pave. Potato was so thinly sliced, absorbed all the goodness from the butter, and was cooked to perfect tenderness. 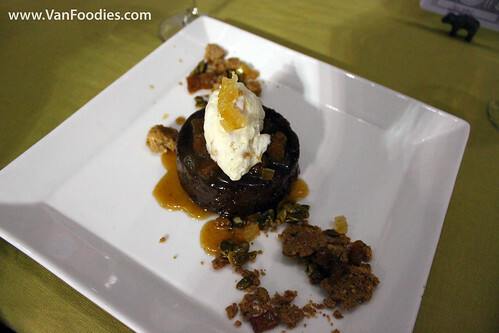 Ginger & Spice by Jackie Ellis of Beaucoup Bakery – gingerbread cake, roasted pears, salted caramel sauce, spiced ice cream. Never a gingerbread person, but I really liked this dessert. Spices such as cinnamon, cardamom, vanilla were all appropriately used in this dessert. Now I crave a visit to Beaucoup. Wines of the dinner were provided by Road 13 Vineyards. Of the 3 wines we tried, I quite liked the 2010 Sparkling Chenin Blanc. It’s dry with a clean, crisp, pear-like flavour, which paired perfectly with the dessert. 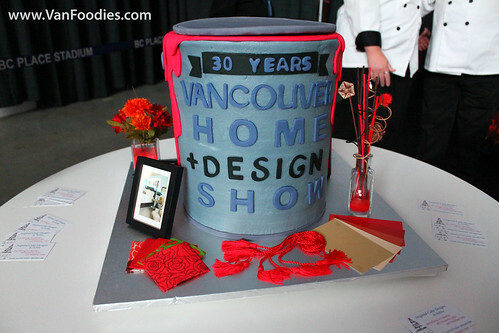 The Vancouver Home + Design Show is on now until Sunday, October 20.